At Receipt Bank we have never been backward about expressing our goal to constantly evolve our offering in order to make the lives of our users more productive everyday. Today we are delighted to announce the most recent additions to Practice Platform, which we hope will do just that! We know many of users take advantage of the 'locked date' functionality in Xero to ensure that accounts are closed and in order before deadlines. We are now making this date visible within Practice Platform so you can easily see the status of your client’s accounts while transferring items to their Xero account from Receipt Bank. We are really excited to have also added two brand new columns to Practice Platform, which increases the insights that Receipt Bank provides you on your clients and their businesses. These new columns work off a calculated average of the values for monthly sales and payroll. 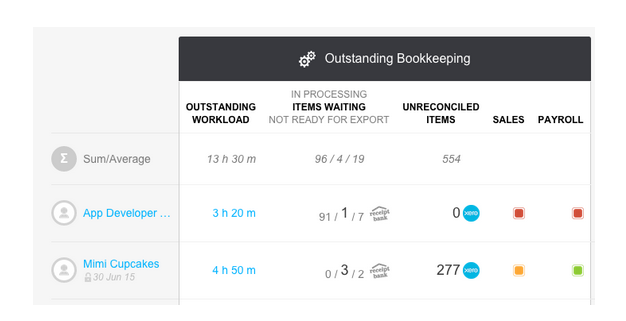 By comparing the current month’s sales and payroll figures to the past averages Receipt Bank can alert you to the work that still needs to be done! Receipt Bank gives you a high level overview of these key bookkeeping activities with an easy to use traffic light signal display. If this month’s values are within a 20% +/- minus range of your client’s monthly revenue and salary figures it is highly likely that the sales have been added and the payroll has been run. This is displayed by the green signal! If however, the monthly figure is outside this 20% +/- range there is work to be done on these - we’ll let you know by displaying an orange signal. Finally, if your client is sitting on a £/$0 value for either of these then we will let you know with a red sign post. We are proud to have these new features for our Partners to take advantage of and are always working on the next instalment. Stay tune to our blog for the next update from Receipt Bank!